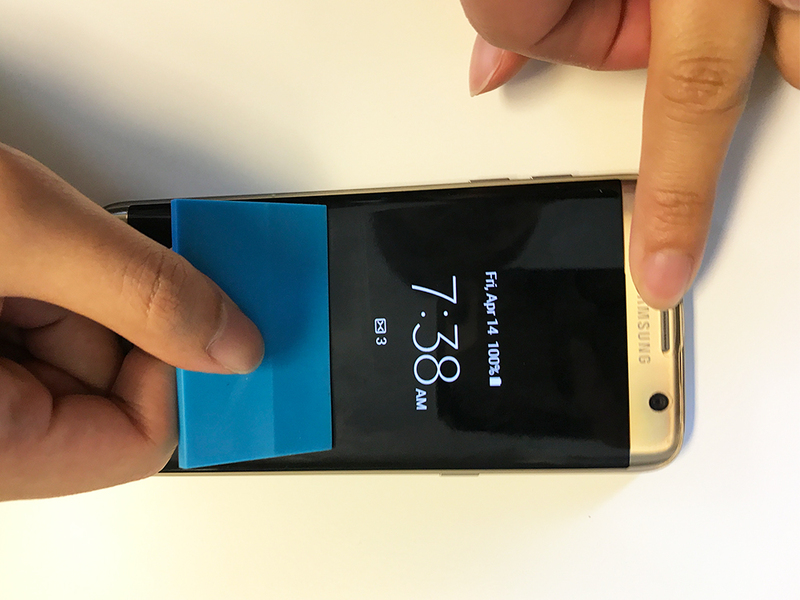 ** For optimal results, install screen protector right before bed to allot enough dry time! Wash hands to allow for a smooth and sanitary installation. Total installation will take up to 30 minutes and a 6-8 hour wait time. For the most optimal application process, the best time for installation is right before bed to allow the screen protector to dry overnight. 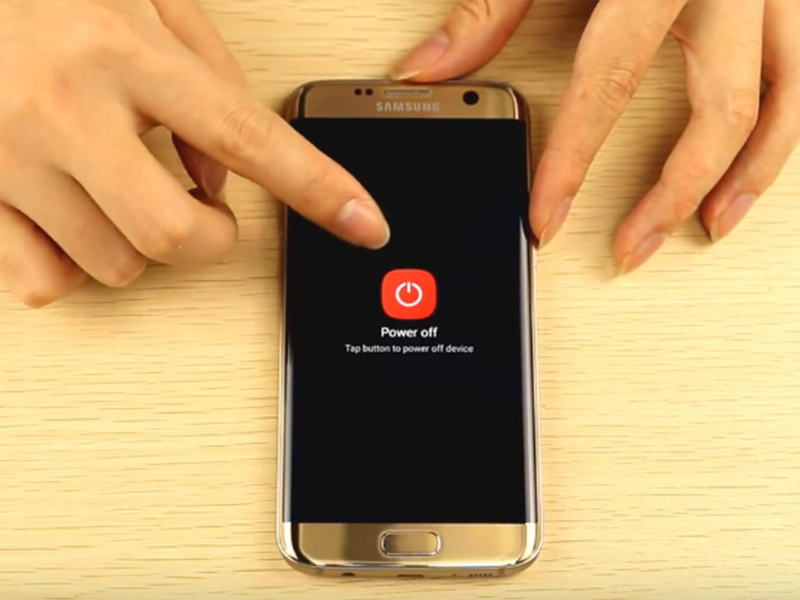 Turn OFF your device before installation to prevent water damage. Check to see that you have all the necessary included tools in your kit to install the screen protector (including screen protector, microfiber cloth, squeegee, installation spray, dust-absorber stickers, and wet/dry wipes). Use the wet wipe, followed by the dry wipe, to remove all fingerprints, excess residue, and oils before applying the screen protector. Use the dust-absorber stickers to catch any remaining dust that may still be lingering on the screen. Shake the bottle and spray your finger tips on both hands. Peel off the protective layer (with tab) and discard it. Spray the screen protector on both sides until it is completely wet. Spray the sticky side of the screen protector heavily and the smooth side lightly. Sequentially, place the screen protector on the phone screen. Be sure to centralize the screen protector and align all holes and cutouts. If you are unable to freely move the screen protector around while wet, peel it off and spray more liquid onto the screen protector and try again. While holding the screen protector in place, use the squeegee to push out and remaining water or air bubbles. This will speed up the drying time and prevent peeling. Squeeze from the center of the screen out to the edge using caution not to apply excessive pressure. 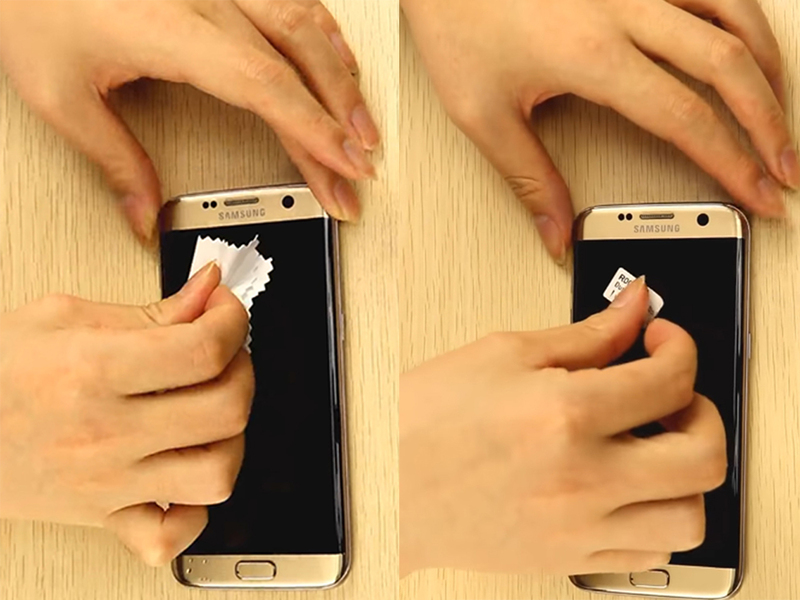 After 20-30 minutes, gently push the edges of the screen protector down completely. 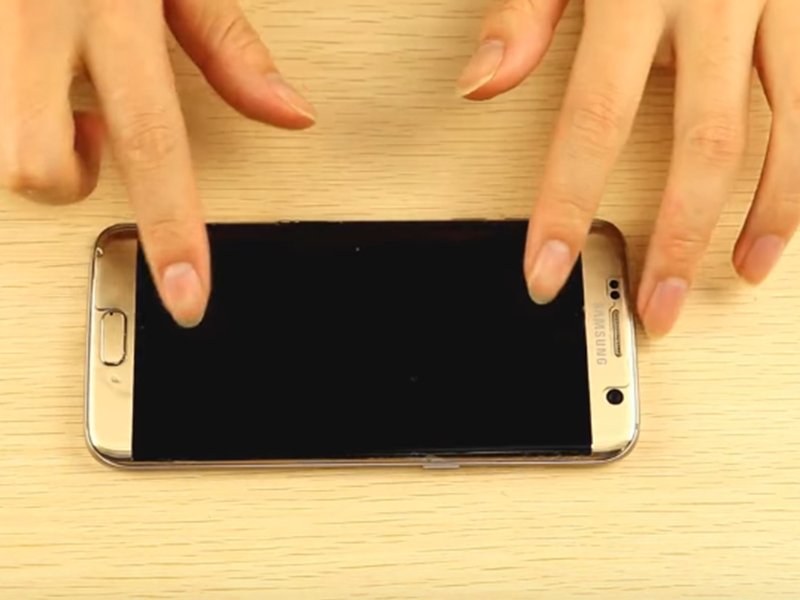 Don’t worry if tiny bubbles or water particles may still be visible on the screen. This is completely normal as the screen protector is still wet. 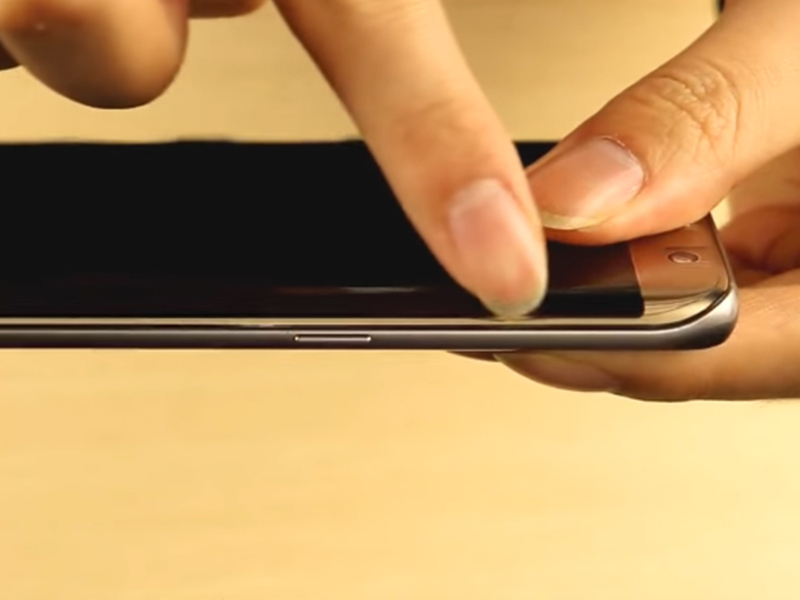 Ensure that the curved edges of the screen are aligned with the screen protector (Note: Edges of the screen protector may not adhere to the curved screen at this point due to being wet). 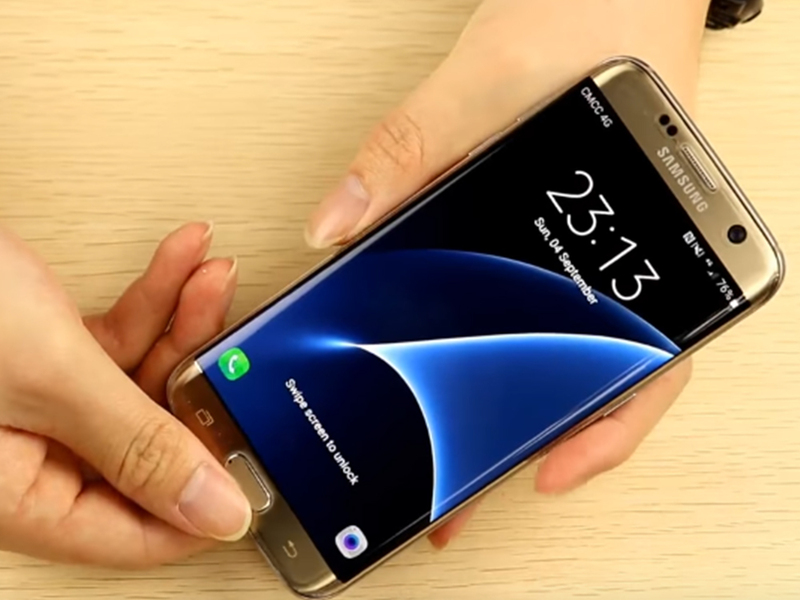 Be sure there is enough room on each side of the screen protector to the edge of the phone to prevent possibility of future peeling. Leave the phone on a clean surface for 6-8 hours (highly recommended to leave it overnight) to dry completely. Any remaining bubbles or water stains will disappear after 8 hours of drying. *If you notice major imperfections, take the screen protector off and reinstall. You may do so by peeling the screen protector off, wash it with dish soap, and rinse it clean with water. Then, repeat steps 1-9 again.